Have you ever looked directly at the Sun only to find it wasn’t there? That’s the question asked by The 2017 Solar Eclipse, the ultimate can’t-miss entertainment experience of the year. Unless you missed it. After years of anticipation, The 2017 Solar Eclipse finally arrived on Monday, perfectly hitting its scheduled launch date. No delays here! I went in unsure what to expect. I walked away a believer. Heads up: This post will spoil the entirety of the events of The Solar Eclipse 2017. Consider yourself warned! The Eclipse franchise has been around since the dawn of time, so most of you probably already know the big picture stuff. 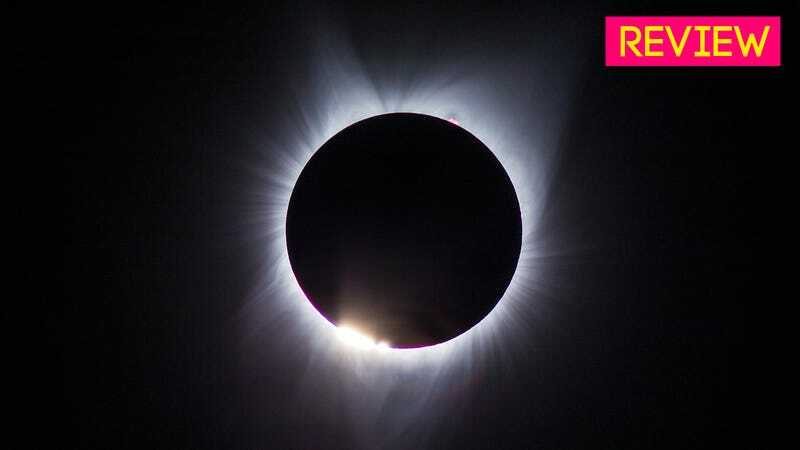 The moon blocks out the Sun in the middle of the day, leaving a black sphere in the sky surrounded by the corona of the Sun’s atmosphere, etc. It can blind you for life, but only if you’re careless. You can experience it solo or in co-op, though it’s much better with a friend. It’s got a limited release window, and if you want to get the real deal you’re gonna have to get in line early. In the months leading up to release, I along with many others struggled to decide which version of the Eclipse to go with. I could’ve opted for the Nashville, Tennessee edition, or maybe the On A Cruise Ship With Bonnie Tyler edition, but I wasn’t always sure what the difference between each one would be. After careful consideration I opted for the Eastern Oregon edition, mostly because I live near there and it was way cheaper and easier there than any of the other options. The eclipse at the heart of The 2017 Solar Eclipse stays pretty much the same no matter which edition you pick, but the sidequests leading up to the main event are subtantially different. The Eastern Oregon edition came with a few distinct challenges. For example, there were wildfires in several major forests throughout central Oregon and beyond, meaning all Oregon eclipse-watchers had to carefully choose where they’d deploy if they hoped to even make it to the main event. The town of Sisters was evacuated on Friday because of smoke and wildfires. Game over before it even began! Guided by my intrepid teammate and navigator, Emily, we made our choice: we’d head out to the Spring Basin Wilderness just south of the John Day fossil beds and roll the dice. That led us to another complication: fuel. If you’ve had much experience with post-apocalyptic fiction, you know how important fuel can be. In just a few days, an actual million new people would descend on Oregon for the eclipse, and the state’s infrastructure was expected to buckle. We were already hearing reports of gas stations running dry. It seemed like only a matter of time before people started eating one another. We opted to fill some gas canisters and tied them to the top of our car. Sadly, the next couple of days’ worth of optional side activities weren’t worth the time it took to complete them. Most of our tasks felt like busywork designed to keep us from getting to the good stuff too quickly. Low points included a challenge called “Sleep Comfortably” during which I continually failed to find a position to sleep in our tent where one of my arms didn’t fall asleep. I also didn’t care for “Find The Phone,” an insipid hidden object game during which I flew around in a panic attempting to find my phone. As I looked, the kid staying with the family in the big Jayco trailer next to our campsite began to practice metal guitar riffs. It was an irritating musical score for an irritating episode. After two days of thirsty, dust-caked waiting, we finally strapped on our packs and made the last endurance run up to the top of the basin to prepare for the big show. That night I was subjected to one final middling round of “Sleep Comfortably,” then it was time for the grand finale. The eclipse didn’t seem like much at first. The Sun felt about the same. It looked the same, too, by which I mean I couldn’t really look at it at all. Maybe I could steal a split-second glimpse through my sunglasses, but that was it. As far as I could tell, it was still the Sun. We had of course read the guide and hit the item store before departing, so we were prepared with special eclipse glasses. Those are basically overpriced sunglasses that are so dark you literally can’t see anything through them aside from the Sun, which appears as a faint orange disc. Put them on, look through them, and, wait! It’s happening! The Sun that was so bright to your naked eye now looks like a sad Pac-Man, his mouth upturned to the heavens in anguish. 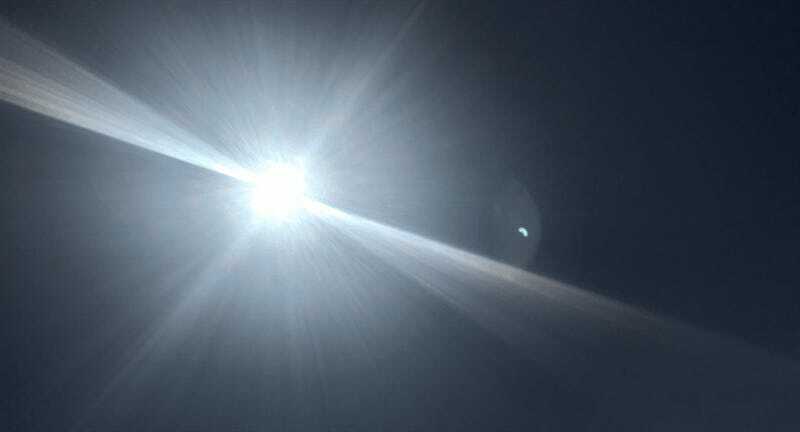 I took this photo by holding my eclipse glasses up over my camera lens. I still can’t believe it worked. Most of the final encounter of The 2017 Solar Eclipse plays out as a photography challenge. You know everyone is going to be sharing amazing, professional shots of the event on social media afterward, and you want to make sure your own are up to snuff. I tried to snap a photo of the Sun, and it basically looked like the Sun. I like to think they sneak little things like that in for the fans, just to let us know they care. Less refined consumers focus on the visual aspect of an eclipse, but it really is a full sensory experience. As the light in the sky begins to dim, the Sun loses its warmth. Your skin starts to feel cooler, then clammy. The breeze suddenly carries a chill. The air around you grows quieter, too. The birds stop chirping. Firebenders are sapped of their strength. You look through your eclipse glasses one more time, and the last remaining strip of Sun is barely visible. Then you can’t see it through the glasses at all. You take them off and, all at once, the world goes dark. It’s happening. This is when it would’ve really paid off to have trained up my photography skills. People call it a solar eclipse, but the moon is really the star of the show. It’s shocking how quickly it takes center stage after more than an hour of sun-covered buildup. It’s just Sun, Sun, Sun, Sun, Sun, HI I’M THE MOON WHAT’S UP?! Just like that, you can gaze up at the Sun with your naked eyes. It’s a jarring tonal shift, but an effective one. All great directors know how to keep your eye focused on the most important thing in the frame, and the makers of The 2017 Solar Eclipse are clearly steeped in the same tradition. The moment the totality hits, there is no question where you’re supposed to be looking. Even those exceptional shots can’t truly capture the experience of staring at the moon as it hung there, blocking the Sun. Can a screenshot of Oryx capture the thrill you feel upon defeating him? Can a freeze-frame of Luigi’s death stare convey the thrill of a perfectly timed power slide? They cannot. Nor can even the most beautiful photograph capture The 2017 Solar Eclipse. You have to see it to believe it. Even a creation as grand as the finale of The 2017 Solar Eclipse comes with a few flaws. My first complaint is that that it all ended so unceremoniously. One minute you’re Ellie Arroway contemplating the Luminous; the next, a fragment of the Sun has cracked ‘round the rim and you have to turn your eyes away. Surely the eclipse’s fleeting nature is part of its appeal, but it’s hard not to wish it went on a bit longer. My second complaint involves the epilogue, which dragged far longer than it should’ve. After hiking out of the canyon and packing up our car, we immediately ran into several hours’ worth of crawling traffic as thousands of people tried to simultaneously navigate a handful of small country roads. It was a nice tribute to Close Encounters of the Third Kind, but kind of an anti-climax. The drawn-out epilogue did give me more time to reflect on The 2017 Solar Eclipse, which I have to assume was by design. Yes, there were some tedious sidequests, long loading times, punishing minigames, and a frequently terrible musical score. But they led me to witness one of the most amazing things I’ve ever seen. In ten years’ time, will I care about briefly losing my phone or having to pee in a field in plain view of a bunch of strangers? No, I probably won’t. Already I struggle to recall specifics. I remember seeing something impossible in the sky. I remember how suddenly cold it got. I remember the look on my teammate’s face as tears rolled down her cheeks. “That was what ‘awesome’ actually means,” she said to me later, not inaccurately, as we attempted to decompress on our way to the car. The word “unreal” gets bandied about so often that it, too, loses meaning. The 2017 Solar Eclipse was unreal, and my mind struggles to keep hold of it. It fades in and out, shuffling itself in with memories of dreams I’ve had, and with the fantastical digital worlds I see every day on my computer monitor. I’ll never forget the eclipse, but in a way I’ve forgotten it already. It existed for two minutes and fifty seconds, and I couldn’t take it with me. At least we get a sequel. Everything’s a franchise these days, part of an “interconnected universe” or some such drivel. You’ll be happy to hear that they’ve already announced a follow-up, which is due out in just under seven years. I strongly suggest you consider preordering if you missed out this time around, despite Kotaku’s overall stance on preorders. If the event I just saw is anything to go by, The 2024 Solar Eclipse: Eclipse Rising will be worth the wait.